The perfect addition to your Turkey Day table, this Bacon Cranberry Cornbread Stuffing might steal the show! Pour in buttered (or oiled) cast iron skillet or 8-9” cake pan. Bake 30 minutes – check with toothpicks after 20 minutes. Remove from oven when toothpick is clean. Some ovens are hotter than others, so baking time may vary. In a large pan, cook the bacon over medium heat until crisp. Then remove the bacon and drain all but 1 tablespoon of the fat. Roughly chop the bacon, then set aside. Add butter to the pan, then cook the onion, celery, and garlic until soft. In a large mixing bowl, break up the already baked and cooled cornbread into small chunks, then stir in the onion mixture, chopped bacon, broth, eggs, cranberries, and seasonings (except for parsley). Put the stuffing mixture back into a your desired baking dish in an even layer (see notes for options). 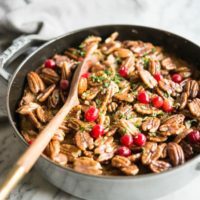 While the stuffing is baking, in a medium mixing bowl, stir together the honey and butter, then toss to coat the pecans. Spread the pecans on top of the stuffing and return to the oven to bake for an additional 10 minutes.